As 2015 draws to a close, here at Check 4 Houses we wanted to take the opportunity to say Merry Christmas and thank you to all our customers that have made 2015 another record breaking year for us. During the past 12 months we have sold over 85 properties – that’s 21% more than last year – from our local areas of Fleet, Farnborough and Basingstoke and as far afield as Essex, Southampton and London. We pride ourselves on our combination of the experience and knowledge of a traditional estate agent with the flexibility and advantages of the modern internet and specialise in the sale of residential property in Hampshire, Surrey, Berkshire and across the rest of England. In total we have saved our clients over £280,000 in agency commission fees by selling homes from as little as £499 or 0.5%+ VAT, delivering an average saving of well over £3,700 for each client when compared to standard agency fees. Our record saving for the year was over £12,631 for a house we sold with an asking price of £735,000 for just £499 + VAT. That certainly gave our client a few extra pounds to spend on their new home! The property market continued to show growth, particularly around the areas of Fleet, Farnborough and Basingstoke with prices rising as supply continues to outstrip to demand, allowing us to deliver even greater savings to our customers. We sold one house without even advertising it due to the interested buyers already registered with us. However the longest sale took almost 12 months due to delays and problems in the chain – showing just how important it is to select the right estate agent that can help support you through what can be a difficult and stressful process. After such a busy year we will be taking a few days off over Christmas. Our offices will be closed from Christmas Day through till 3rd January. We will be back raring to go on Monday 4th January at 9am and looking forward to another record breaking year. If you are looking to sell your home in 2016 then please give us a call on 01252 819725. We would be delighted to give you a free valuation of your home as well as talk you through our competitive pricing options, personal service and price match guarantee. 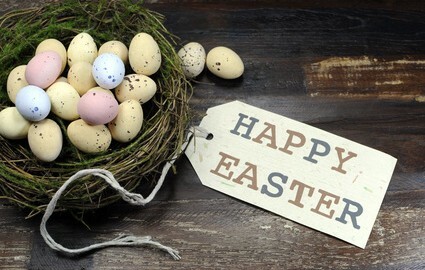 With Easter just a few days away here’s our round up of some of the top Easter events in our area, providing lots of great reasons to get out and about in the towns and countryside of Hampshire and Surrey. Camberley are hosting an Alive and Wonderland Themed adventure on Saturday 4th April from 10am-4pm with fun for all the family including 8ft mushrooms, giant tea cups and a huge ‘Drink Me’ bottle, with free face painting too. There’s 2 days of Easter fun in Aldershot town centre with a bunny hop competition starting on Friday 3 April, where children can search the town looking for pictures of Easter eggs hidden in shop windows and uncover the hidden word. Saturday 4 April will see the return of the very popular children’s farm in Aldershot Town Centre. Children will be able to meet springtime favourites including lambs, chicks, goats, rabbits – all for free. Those looking to stretch their legs might enjoy the Easter Walk at Fleet Pond on Friday 10th April and Saturday 11th April from 10am-2pm. You can join the Countryside Rangers on a self-guided walk which is suitable for all ages and dogs are welcome. Meet the Rangers in the picnic area to get your Easter pack, find the clues, answer the questions, return to the picnic area and collect your Easter egg. No need to book – just drop in anytime between 10am – 2pm. If you prefer to put your feet up and watch the world go by then how about a ride on the miniature train at the Viables Craft Centre in Basingstoke on Easter Monday? Whatever activity you end up deciding upon, we hope you all enjoy a very Happy Easter. At Check 4 Houses we specialise in the sale of residential property in Hampshire, Surrey and Berkshire and we know the towns and cities of Fleet, Farnborough, Aldershot, Basingstoke, Camberley, Yateley and Farnham inside out. We can sell your home from as little as £499 or 0.5% + VAT so contact us today for a free valuation on 01252 819725.